Sparks Road forms a major arterial road within the road network of the northern portion of Wyong Shire, linking the F3 Freeway at the western end to the Pacific Highway at Tuggerah in the east. Located in a rapidly developing area near the Warnervale Town Centre, Sparks Road was upgraded to meet traffic demand. RMS engaged GHD to prepare the road design documentation for the upgrade to two lanes in both directions and improved intersections. Corkery Consultants were engaged as specialist consultants to provide landscape assessment as well as detained design and documentation. A Landscape Assessment was carried out to provide an overall framework for the preparation of a landscape concept for the road corridor. Detailed design and documentation of the agreed landscape concept was then carried out and subsequently implemented. The Landscape Assessment involved identifying and describing a series of Landscape Character Zones. The zones are areas that are relatively consistent in terms of their combination of landform, vegetation and land use, which results in a distinctive landscape character. Remnant stands of Eucalypt trees and native understorey were significant aspects of the landscape character of the road corridor. by the landscape design included sight lines and clear zones as well as overhead and underground services. 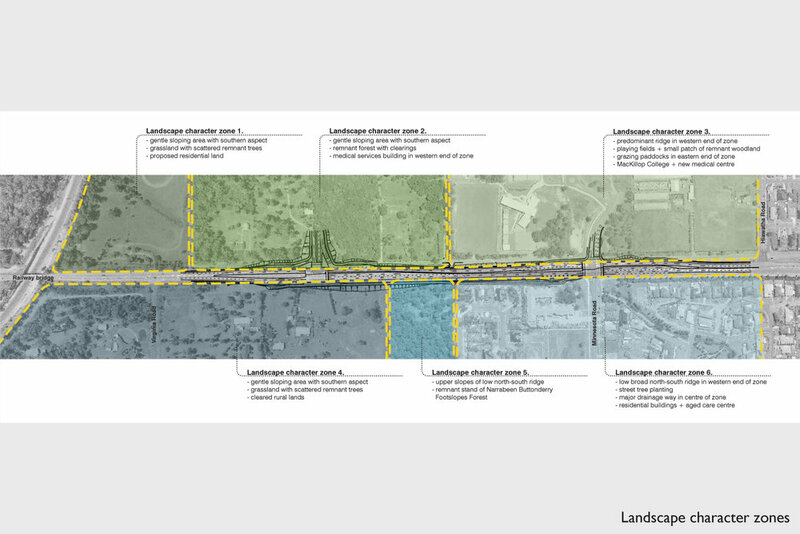 Detailed design and documentation of the landscape works for the Sparks Road upgrade was carried out by Corkery Consulting working in collaboration with the GHD engineers. Documentation included preparation of landscape works drawings with details and specifications.